Others followed but it didn’t just came from nowhere. I have never given much thought to the racial element when it comes to Metal music, as to be honest, I didn’t really care of it. Whoever admires the kind, devoted and wants to trail after it with an own creation, by all means, just do it and join the large family of bands. However, since it is the US Metal band we are talking about, and history could relate to the almost non-relationship of African-American with Heavy Metal, this here story made the sort of a headline. Almost two decades ago I first found out about the Cleveland band, BLACK DEATH, which was considered to be the first African-American Heavy Metal band. Other than the guitar lord Jimi Hendrix that shredded back in the late 60s, a Rock N’ Roller hall of famer, none came after him with an ample message of the heavy music until these guys showed up. 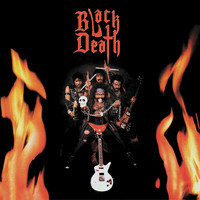 Now, thirty three years after the original release, Hells Headbangers Records reissued the self-titled “Black Death”. Other than letting the general folk about a good band, I believe that there is also a proof to the majority African-American communion that not everything generated from their essence is merely R&B or Rap. In comparison to the original recording from 1984, which sounded pretty close to cassette quality, there is a margin of improvement in this reissue in terms of the digital remastering. Especially in this album, there is something about the analog recording that is so appealing that it is hard for me to put a finger on, however, it is good enough to stick to this sensation no matter if it has a name or not. Furthermore, this release has a kind of drive that is a bit of a difference from other albums of its time, mostly generated through the groove-laden rhythm section of the BLACK SABBATH and THIN LIZZY nature. These guys were on the groove, and they sure made a good use of it. The riffages were quite simple, largely 70s BLACK SABBATH with a tinge of JUDAS PRIEST, yet nothing too overwhelming but those did fit right to the atmosphere of each of the songs. Nonetheless, when it came down to soloing time, a heavy load of ol’ Hendrix’s legacy came back from the dead in full swing, performances that voiced passion and enthusiasm. BLACK DEATH’s songwriting is solid, not what you would call over the top, not aiming to be catchy, which is rather in their benefit but enough to be satisfied with, needless to say a good headbanger. Some of the songs sounded over extended, as if forced to be lengthier for no reason, and others just didn’t click, or mainly its production values, though slightly polished, didn’t really help the experience. “Streetwalker” grabbed me right from the get go, Jimi Hendrix meets Heavy Metal, a dangerous meeting between vintage and stamina. The buildup is simply insane, a proper way to gather around forces for a stellar blue collar Metal tune. “When Tears Run Red (From Love Lost Yesterday)” is a sweet bloody red ballad, certainly not of the cheesy AOR examples of the same period, a creation that holds something wicked in its basis, turning into in a stormy havoc swept away by a stream of emotions. ”The Hunger” displays a 70s assault, strong groove, great beats, a foreboding heavy metal vibe, cutting edge soloing, revealing Siki Spacek’s screeching vocals that are a factor to be reckoned with. “Black Death” observes a virtuous blending of BLACK SABBATH and MERCYFUL FATE, groovy with a barrage of solo displays, the band’s darkest tune sharing occult elements. Though I didn’t find “Black Death” to be one of the stars of the 80s, this album is still a relic, a collector’s must and earns the respects of the contemporary Metal scene. The band’s energies had enough juice to make a notable effort that will, and can, live the test of time. There no better reason why to reissue it if there wasn’t a demand in the first place.